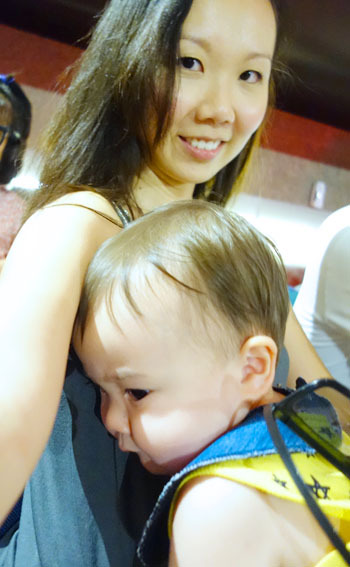 Happy Feet Mumble’s Wild Ride @ Sentosa 4D AdventureLand | Beverly's Net: family. food. fashion. 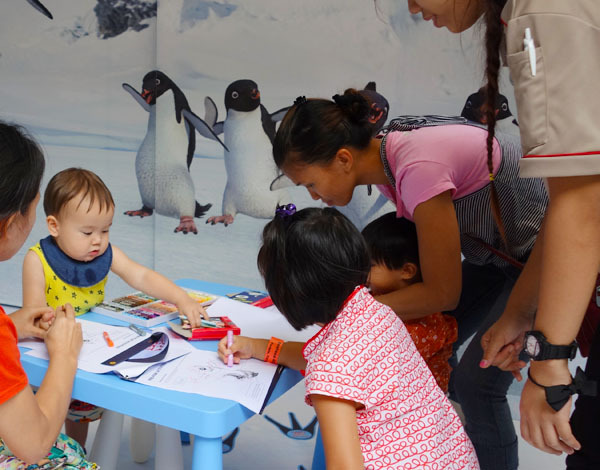 Happy Feet Mumble’s Wild Ride @ Sentosa 4D AdventureLand – Beverly's Net: family. food. fashion. 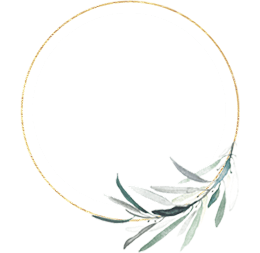 I originally wrote this article for the awesome online magazine Material World, which you can read here. I’m super glad they helped organize it for us, as without them, I wouldn’t have known this existed! Thanks Material World! 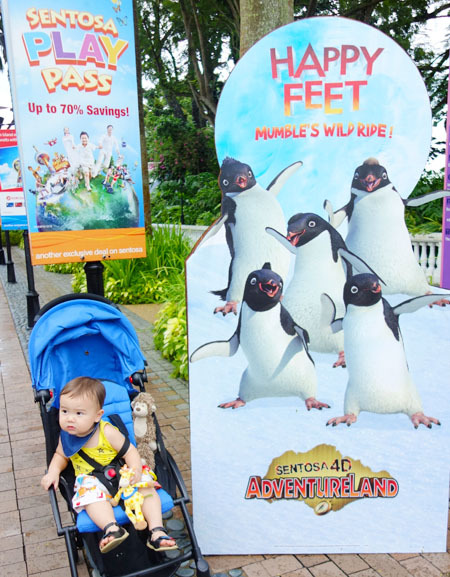 Sentosa 4D AdventureLand launched its new 4-D experience, Happy Feet Mumble’s Wild Ride! a few days ago, on 14 November 2013. 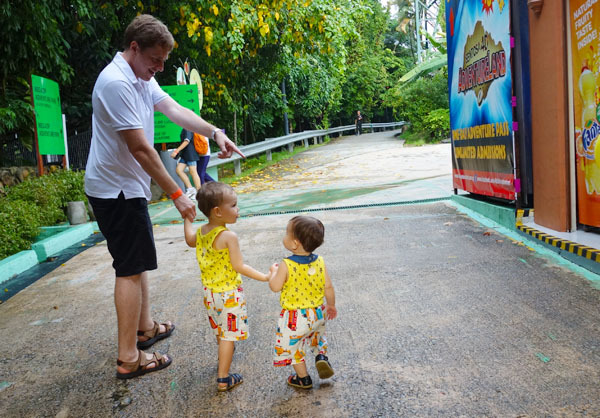 I’m such a tourist and am such a sucker for all things Sentosa-related, so I was very excited to be dragging the kids there, and with two of their friends in tow. The older kids (Hunter and his girl friend) were appropriated hyped up with promises of “lots of dancing penguins”, so they were excited! But let me explain 4D AdventureLand first. The four-dimensional theatre is a motion-simulated experience, where you sit in a pod (kind of like a rollercoaster ride) which wiggles and jiggles and whirls in tune with what you’re watching on screen – whilst you wear 3D glasses. To add to it, there are extra effects like water spray, swishing stuff at your feet, etc, etc. Think of it as a sort of multi-sensory theatre. I guess the future of standard cinema?! So to watch Happy Feet Mumble’s Wild Ride! 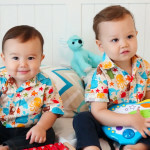 , we first huddled into a little room, which confused me. I thought we were going to sit down, not stand together in a group?? With the flashing lights and trippy sound effects, the kids got kind of freaked out, and so did I (from confusion). Turns out, that was just the safety briefing. Whew! The doors in front opened and we walked through to a HUUUUGE cinema room, with lots of fancy looking pod things to sit in. 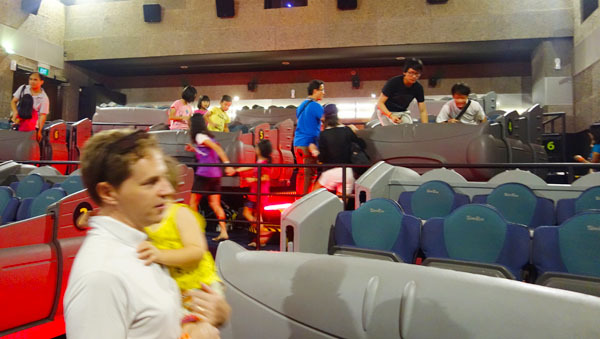 After settling ourselves in and buckling up, the lights dimmed and the 4D experience started. The kids were pretty excited for the first-half of the experience, because it was all about dancing happy penguins that skipped around and slid down ice. It was rather cute! Then…. errrrmmm…. the dreaded scary seal came. He wanted to eat Mumble!!! OH NOES!!!!!!!!!! 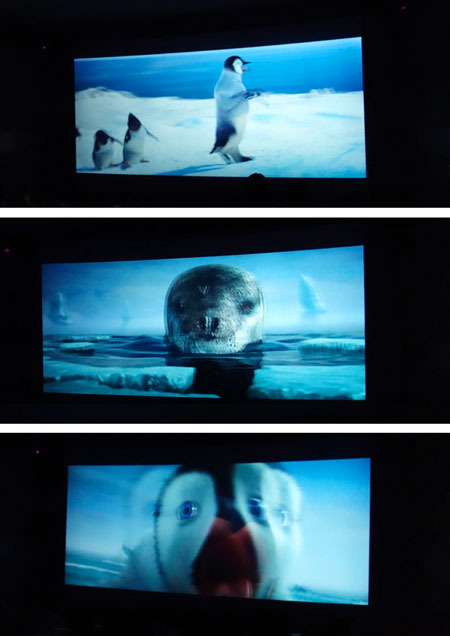 And so began the thrilling chase under water, with the seal snapping away at Mumble. All in 4D for us. 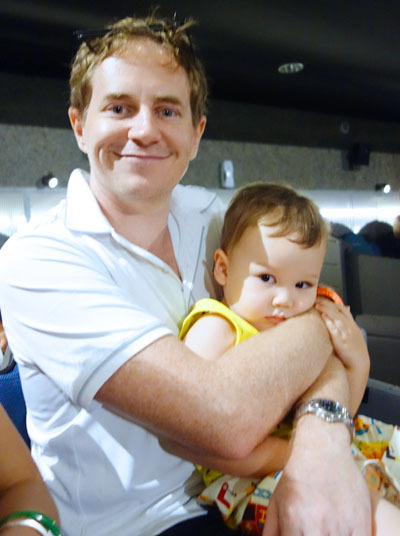 And her 13 month old brother was in total glee over it all, flapping his arms in excitement. Go figure why the youngest kid is the bravest one! 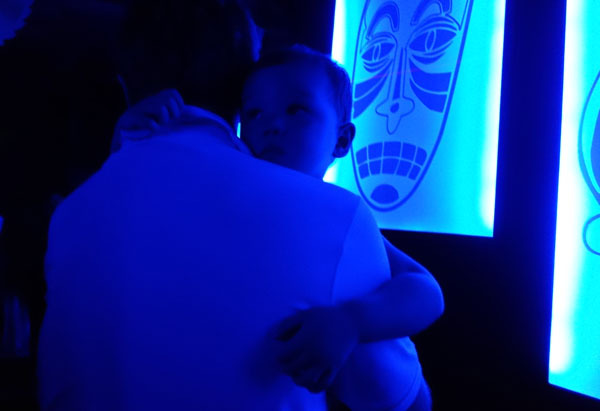 Sooooo.. for this reason, I would say that this ride is fine for <1 year olds (I guess they are a bit young to realise what is going on), or for 5 year olds and up, when they don’t get as freaked out. Or if you have brave young kids. For BIG kids and adults? You’ll have fun!! It’s like a rollercoaster ride, but very safe and contained. 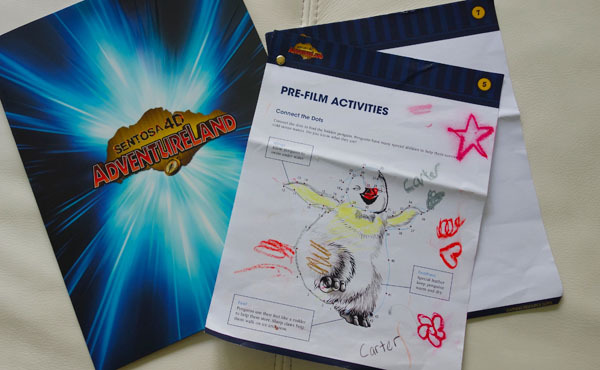 It’s a fun concept, and your ticket also allows you entry into the other 4D experiences: ‘Journey 2: The Mysterious Island’; ‘Extreme Log Ride’; and the interactive 4-D shoot-out game, ‘Desperados’. There’s a little kid station just outside the ride, where the kids are given a small kit each. Crayons are provided and there are staff there to help out. 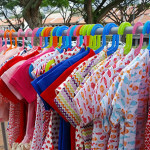 The kids can do join-the-dots, crossword puzzles, colouring etc. 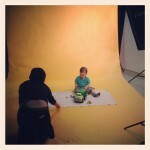 Our 5 year old enjoyed it and diligently did it all. 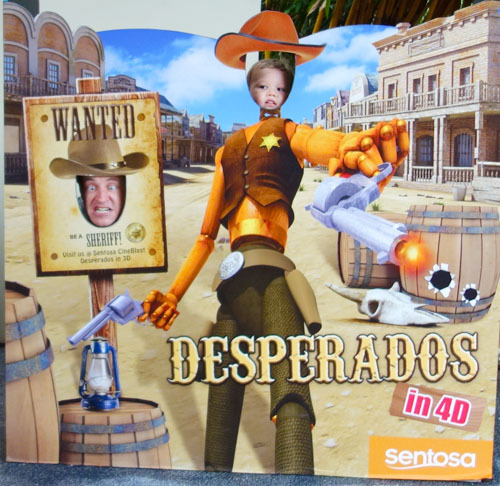 The Desperados! ride had a little photo-opportunity area outside. Hunter and his Daddy had a grand ‘ol time posing! 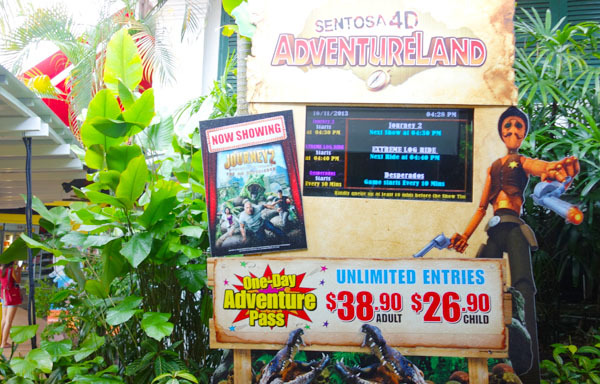 Sentosa 4D AdventureLand is a fun stop for the kids if you’re in Sentosa. It’s especially awesome if you’ve lucked out and it’s raining, because it’s one of the few attractions that are completely covered. Plus, with unlimited entries, you can probably kill around two hours or so there, whilst the kids go on all of the rides.